Dalaman, in Turkey, is a region blessed with many a must-visit attraction. Tourists to this area should consider themselves very lucky – the district is home to a wealth of history and an extraordinary heritage, as well as some of the most beautiful natural beauty Mother Nature saw fit to bestow upon a land. Temperatures soar in the summer months to the mid-thirties with 16 recorded in the winter. Flights to Dalaman are relatively easy to obtain online and for a good price. So book tickets to this magnificent district and make it your mission to see the must visit attractions in Dalaman, Turkey. There are many reasons to visit the Dalyan Delta during your stay in Turkey. Of course, situated as it is between the sea and lake Koycegiz, there is a huge variety of wildlife on offer – birds including herons, storks and all manner of migrating specimens congregate here. The beaches are practically empty, and while you won’t find a sunlounger here, you will be fortunate enough to experience miles and miles of untouched sand. 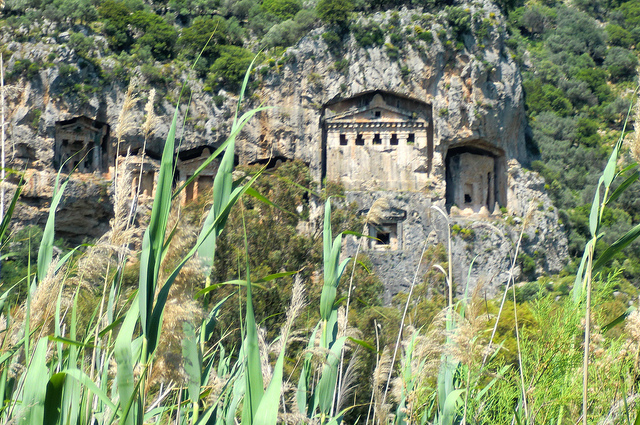 But the main attraction of the Dalyan Delta is undoubtedly the Lycian tombs. Carved out of a rock face in 400 BC, the efforts ancient builders went to in order to ensure their construction are mind-boggling. Sultaniye – a small village located on Lake Koycegiz – was once a sanctuary dedicated to the Goddess Leto. Nowadays, the only pilgrims likely to be making their way there are tourists. Sultaniye is home to a number of ancient ruins based around its hot springs, which have been restored to their former glory and transformed into one of the region’s most successful tourist developments. It is well worth a visit, particularly if you are a health freak. The sulfur-infused waters are supposedly good for treating skin complaints, arthritis, muscle fatigue and rheumatism, among other ailments. As these spas have been around since the Roman times, there may well be some truth about this. The long shingle beach that makes up much of Sarsala Cove is often populated by boats, moored just offshore. And with good reason – this is one of the most picturesque spots in all of Turkey. Located right on the west coast, its rounded hills are covered in sweet-smelling pine trees. Roam the forests for hours on end, or sit and enjoy the gorgeous azure waters as you lie by the beach, sunning yourself. Sarsala Cove is also the location of one of the greatest logistical errors in the entire world. This one is for you if you’ve ever gone to Maidstone East instead of Maidstone West, or Manchester Victoria instead of Manchester Piccadilly. The Alexandria railway station was commissioned in 1905. But an unfortunate mistake meant that the materials were shipped to and put together just a few thousand kilometres from their intended destination – in Daleman near Sarsala Cove. The building is still there today – make a point of visiting and paying tribute to one of the biggest shipping errors in all of history.